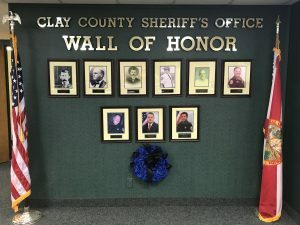 The Clay County Sheriff’s Office Wall of Honor recognizes the officers who made the ultimate sacrifice. These brave men lost their lives in the line of duty protecting and serving Clay County. We proudly display their photographs at our headquarters and honor their sacrifice, which will never be forgotten. Deputy Ben Zirbel was killed in the line of duty due to injuries sustained in a motorcycle crash in August of 2018. He was 40 years old at the time of his death. His dedication to the CCSO was unwavering. Det. White was shot and killed during a drug investigation on February 16, 2012. Just 35 years old at the time of his death, he was posthumously named our agency’s 2011 Deputy of the Year for his work to reduce the illegal pill trade in Clay County. Sgt. Hayes, 39, died on May 26, 2002 as a result of a heart attack. Dep. Walker died on December 17, 1994 as a result of medical complications caused by materials used during his work as an evidence technician. Auxiliary Dep. Caton died on July 15, 1979 as a result of a heart attack suffered while working a traffic detail in Orange Park. Sgt. Watkins died on May 3, 1976 after responding to an attempted suicide call. A fatal crash occurred while he was following an ambulance in route to the hospital. Sheriff Cherry served from 1911 until his death on July 6, 1913. A suspect shot and killed him during an interview. Sheriff Wilson served from 1905 until his death on July 10, 1906. A suspect shot and killed him during an arrest attempt aboard a train. Sheriff Peeler served from 1889 until his death on May 10, 1894. He was shot while trying to stop an argument between two men at a train station. On May 7, 2013, the newly-constructed Clay County Law Enforcement Memorial, renamed the Detective David A. White Memorial Headquarters, was dedicated. 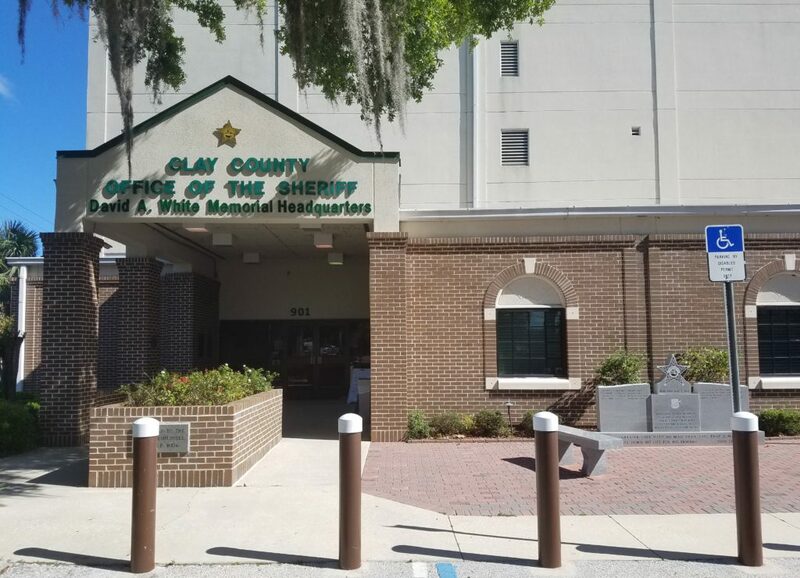 The front entrance of the Green Cove Springs building was transformed and now includes a granite memorial wall, two granite benches, a flag pole and entrance grounds that are paved with engraved memorial pavers. Local residents and business owners donated funds and most of the supplies needed to create this memorial. We remain grateful for their contributions.